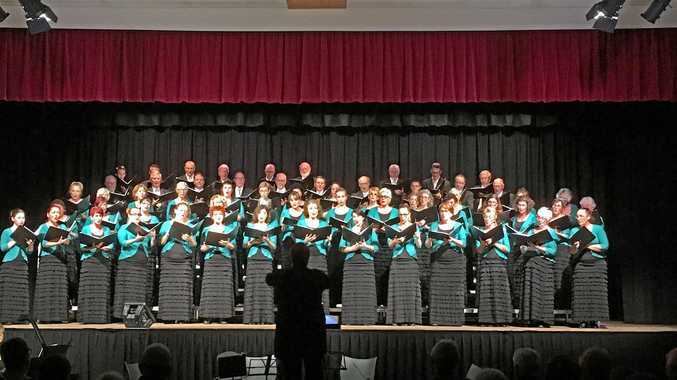 AN April shower and cool breeze welcomed the Sunshine Coast Oriana Choir to the Maleny Community Hall on Friday night for the magnificent opening of their three-concert series across the region this weekend. And what a spectacular opening it was. The choir of 60 voices certainly warmed the hearts of an appreciative audience. They were treated to a world-class choral performance that could have taken place in one of the grand cathedrals of Europe. Opening with an appropriately dramatic and skilfully delivered rendition of Mendelssohn's Yet Doth The Lord from Elijah, the choir were in fine form, accompanied by the stunning Sanctuary String quartet led by Daniel Lopez, and complemented by the keyboard talents of Oriana's artistic director and accompanist Fay Baker. Directed by Sandra Milliken, the choir delivered an impressive program of sacred repertoire including an exquisite ladies' ensemble performance of Schubert's Psalm 23 and a magnificent delivery from the men of Welsh composer John Hughes' Calon Lan. The choir, featuring soloists Elisabeth Wallis Gadtke, Sarah Laws, Scott Gadtke and Murray Milliken, delivered an outstanding performance of Mozart's Vespers, which was written and intended for vespers day in the Salzburg Cathedral; the same cathedral that Oriana had the privelege of singing in during their tour to Central Europe in 2016. Divine: Music for the Soul will be performed tonight, Saturday, at the The J in Noosa at 7.30pm and again on Sunday at Caloundra Uniting Church at 2pm. Tickets at the door. Caloundra: Adult $30. Concession/group $25. School children $10. Noosa: $39 Adult. $35 Concession. School-aged children $10.